Are you planning a wedding and getting depressed by the idea that you are expected to make choices for a wedding which is like everyone else’s? Are you starting to feel like all wedding dresses are white tulle, all wedding rings simple gold bands, and all ceremonies must either be held in a church or a garden? Don’t worry! There are plenty of ways you can leave your individual stamp on your wedding day. After all, this day is about you and your soul-mate expressing your love and commitment to each other, so your ceremony should truly be a reflection of you. Here are some tips and ideas for letting your individual personality shine on your wedding day. Your wedding rings are one great way to express your individuality and let your own personal style shine through. They are also one element where individual personality is probably most important of all, because, after all, you will be wearing them on your hand every day for the rest of your life. So you want to make sure they suit you, and are not just the cookie-cutter wedding bands which everyone else has! These customised platinum couple bands are a unique choice which will certainly set you apart from the crowd. With a range of styles and designs to choose from, you will surely be able to find a design which you feel truly reflects who you are. 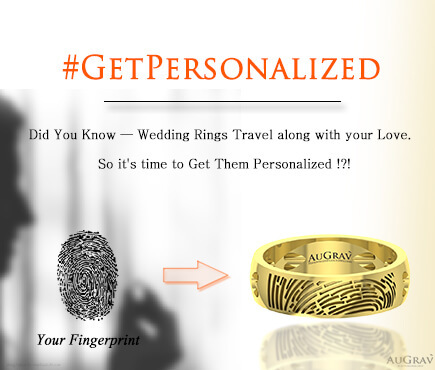 There is also the option to customise the rings with fingerprints or be engraving your names, making this even more unique to you. As you sift through bridal magazines, it may seem like all wedding gowns are versions of the same dress. However, you don’t need to be constrained by a certain design, fabric or even colour: remember that it is your wedding day, and you can choose to wear whatever dress you want! You may choose to represent your own individuality and style through a non-traditional style of gown, or by wearing a colour rather than classic white, cream or ivory. 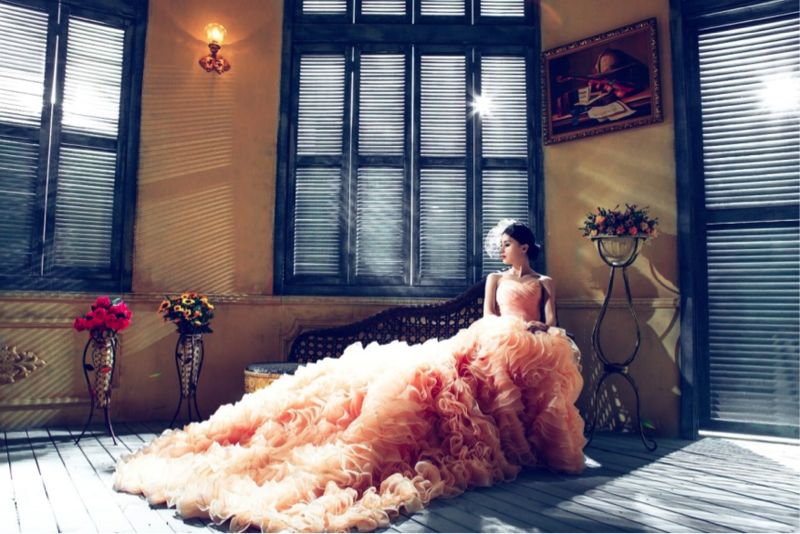 A great way to express your own style and individuality is by designing your own wedding dress. You can find many great fabric shops online, where you can buy literally any kind of fabric you can think of. You are then only limited by your own creativity in coming up with a wedding dress which expresses your own unique style and individual tastes! Another way you can express your individuality on your wedding day is through your choice of venue. When it comes to wedding venues, people seem to limit themselves to a narrow range of standard choices, but it doesn’t need to be that way. You can hold your wedding in any venue which is large enough to fit your number of guests, after all. Examples of unique and different wedding venues include a state or national park, on-board a boat, or a theme park or fun fair. Most importantly however, if you want your wedding venue to reflect you as a couple, start by thinking about your own favourite places, hobbies and interests. If you are both keen readers, for example, why not hold your wedding at a historic library? As an extra bonus, choosing a venue which is not traditionally used for weddings may save you money, as weddings do tend to add to the price tag! How many wedding receptions have you been too with the same “chicken or fish” options for a standard three course meal? Who says you cannot choose your favourite kind of food to share with your guests on your big day? If you love Thai food, why not ask you favourite Thai takeaway to cater on your big day. Or if your partner’s favourite meal is deep-fried chicken, serve that to your guests – after all this day is about the two of you, so it should reflect the things you love. And more likely than not, your guests will love it too. Wedding receptions can start to all seem the same after a while. Keep things interesting for your guests with quirky entertainment and activities which reflect your own loves and interests as a couple. If you both share a love of video games, why not have a Playstation or x-box gaming corner at the reception? Or if you love to sing, set up karaoke and encourage your guests to participate by kicking off the festivities yourself. Not a fan of wedding cake? Try a different kind of cake like this literal cheese cake. Make an anniversary piñata: guests leave a message, prediction or memory inside a piñata which you will open on your first anniversary. Have a creative version of your guestbook, by having guests write on Jenga blocks instead. Make activity packs for the kids at their place settings to keep them entertained: you can include colouring packs, games and toys. How To Let Your Individual Personality Shine on Your Wedding Day Overall rating: 4.7 out of 5 based on 235 reviews.